Kits offer a cost savings over purchasing the products individually. This kit includes the ExSim-Max exam simulations needed for the Microsoft MCSA: Windows Server 2016 certification track. The MCSA: Windows Server 2016 validates the skills needed to run an efficient and modern data center, with expertise in cloud technologies, identity management, systems management, virtualization, storage, and networking. 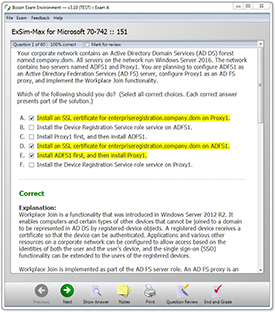 Download the BEE and try the practice exam demo to see how ExSim-Max can help you pass the MCSA exams.